500 Words From is a series of guest posts from writers, in which they talk about their latest books. J.W. 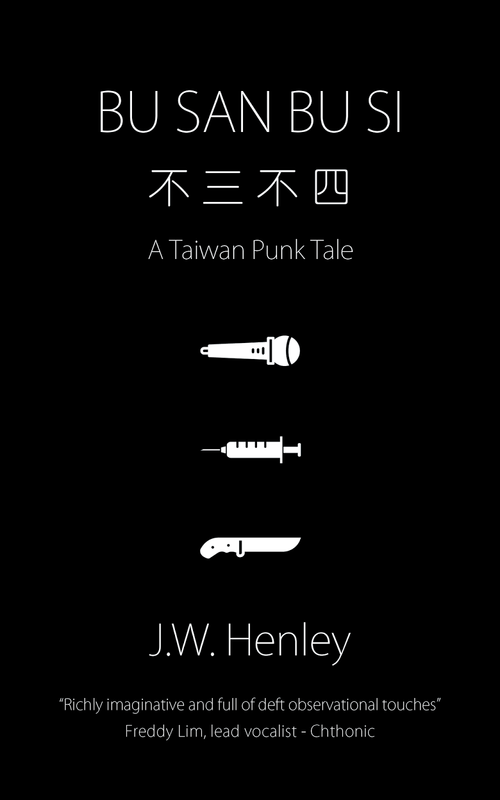 Henley has just brought out his second novel Bu San Bu Si: A Taiwan Punk Tale, which throws readers headlong into the grimy underworld of Taipei’s outcasts, revealing a side of Taiwan few outsiders ever see. Bu San Bu Si (not three not four) is a Taiwanese idiom used to describe punks, lowlifes, and losers – people who don't fit in. Henley’s protagonist, Xiao Hei, is bu san bu si. Talented and self-destructive, young and reckless, Xiao Hei is the guitar player for Taipei punk band Resistant Strain. He takes punk as a lifestyle. Live Fast. Die Young. Get Drunk. Stay Broke. And yet, at the back of his mind he feels a gnawing lust for fame; a longing for the big time. He seizes his chance, even though it is offered by former mob boss Jackie Tsai, a key player in the Taipei criminal underworld. Once Xiao Hei is bound to Jackie, everything is on the line. His family. His girl. His band. Even life itself. How much is he willing to sacrifice for fame? How much is he willing to give, and who is he willing to give up? Journalist J.W. 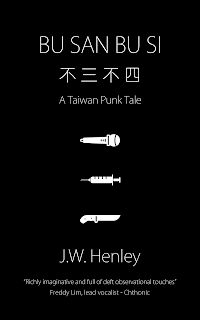 Henley has lived in Taipei for over ten years, documenting the underground music scene, and playing in Taiwanese punk and metal bands. Bu San Bu Si is his second novel, following up on the success of his first, Sons of the Republic. In much of Asia, that's saying a lot. Taiwan, like many other countries in the region, is a land pensions largely forgot, and one where filial piety is still a pillar of a largely conformist society. So many Taiwanese youths find themselves caught between a low-paying passion they would like to pursue and a culture that all but demands they put (“childish”) creative aspirations aside following their school years, sacrificing them for the good of the family. This is the struggle facing Xiao Hei, my main protagonist in Bu San Bu Si. He may as well have bu san bu si tattooed across his forehead, and in creating him, I drew on a lot of people I've encountered in my decade-plus involvement in the Taiwanese music scene as a performer, promoter, and journalist. Many of my friends, contacts, and fellow musicians have a deep-seated love for punk, a form of music that is a cultural import, and they want to make it their own; to make their mark on it in the most profound way possible and put a unique Taiwanese stamp on it. Yet, they are ever-aware of the pull of their family duties, mainly because their parents, like their own parents before them, constantly remind them of what they owe to them and to their ancestors for having been brought into this world. Some Taiwanese musicians manage to find a balance as they grow older, maintaining music as a hobby on the side while shuffling along a safe career path that will see their own futures secured, along with those of their parents, their partner, and their children, especially their sons. Others, though, like Xiao Hei and his band mates, lash out. They rebel against the system they were born into, resentful of being tethered to rigid structures and beliefs they resist, while feeling guilty for their seeming inability to go with the way things have been done for generations, as most around them seem able to do, in their own unassuming, stoic and socially responsible way. It is a quiet conflict, to be sure, one that would likely go unnoticed, or at least undiscussed, by most in Taiwan, this industrious and dutiful nation of 23 million. But it is heard in the depths of the underground music scene, roiling beneath the surface. It's a kind of heartache, a longing that manifests in the art made by those who make it purely for art's sake, but still, somewhere deep down, long for greater recognition and exposure, unsure of how to achieve it, or if it is even possible to find it in a place where art, especially outsider art, is held in low regard by all but a few. This is the tension felt by my fictional Xiao Hei, but it is a real problem, faced every day in the dives and live houses of Taipei, Tainan, Kaohsiung, and Taichung. It is a problem worth hearing about, because it is one we all live with, to some degree or another. In the end, Xiao Hei will have to make a choice about what is most important to him, as do we all at some point in our lives - family, culture, the pursuit of a dream. Rarely are we able to preserve all three. Rarer still, when one overshadows all, do we live out our days without seeing the others crumble. The choice is both blessing and burden - one we might count ourselves lucky to have at all. But as Xiao Hei comes to realize, our choices can backfire in an instant, disappearing in a haze of selfishness, greed, and ignorance. Then comes the true challenge: finding our way to redemption. Details: Bu San Bu Si is published by Camphor Press in paperback and eBook, priced in local currencies.